All the attention and press that Facebook got months ago when it re-designed the “Like” button really got me thinking. Mostly about what a “Like”-obsessed culture we’ve become. It wasn’t always this way, you know. As I remember, it was in junior high school when the concept of ‘like’ first gained significance. “Like” began to go beyond the basic-and-accepted meaning (i.e. “I like to read.” or “I like Devil Dogs.”) in order to describe that entry level of romantic expression. “I heard that Linda likes Danny now, but mostly because she found out that Fred doesn’t like her as much as she likes him.” You remember those days, don’t you? In the seventies, “like” became a staple in Hippie-talk. “I mean, like, peace and love, man, was, like, where it was at”. And in the eighties and nineties, using ‘like’ constantly picked up more takers. There was an almost tacit competition among Valley Girl-types for the highest number of times one could use “like” in a sentence. “I mean like totally, like whatever, like duh!”. Then came FaceBook, the social media site that introduced a voting-like gesture where one could indicate that she/he ‘likes’ something simply by clicking on a universal “thumb up, fingers folded” icon. Fairly straightforward at first, it’s now unplugged and out of control. You see, when you’re on Facebook, not only does no one know you’re a dog but, now, you have a quiet way to indicate things way beyond a vote of favorability. By hitting the “Like” button, you can acknowledge that you have at least seen another’s posted status, new cover photo, recently-uploaded pet video, whereabouts, recent meal, fleeting thought, or even someone’s mood. 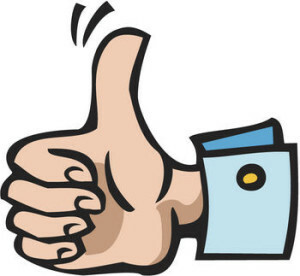 By hitting the iconic thumb-up button, you can also ‘Like’ a particular page, someone’s (or your own!) comment, or even acknowledge that you also like what your Friend liked that someone else posted. Got that? There’s also something called, “Like Pages”, a rolling summary of only those postings that you have formally “Liked”. And there’s “Invite to Like”, where you can bother every single one of your 1156 FaceBook Friends asking them to “Like” something whether you’ve liked or not. You can also see a full listing of their Like Pages which – like yours – shows everything they’ve ever liked. And, of course, the “Ticker” view which shows you what your Friends have just recently liked, whether you – or they – like it or not. It’s all pretty simple to do and to decode, once you get the hang of it. And, really, what’s not to like about THAT! ?